The culinary students of Normandy High School prepare lunch for students, teachers and the public from October to May. Each week a student manager will work to provide unique specials for your enjoyment. The regular menu has many of the Invader favorites to tempt you including the Sir Norman Burger and the ever popular Oreo milkshake! The students work hard to provide you with a delicious meal at a reasonable price. Occasionally throughout the year, the restaurant may be closed for competitions and special events. Such closures will be on the Morning Announcements (check the web page) or phone ahead. Career and Technical Education Culinary Arts students operate the Sword & Shield restaurant, supervised by their instructors. Click for more information about Culinary Arts. 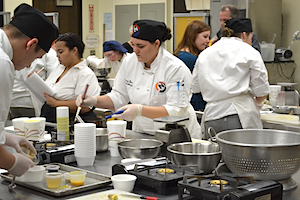 The Sword & Shield is proud of the Culinary students and each dish they create. We teamed up with PACT-TV to bring you some of our favorite recipes and we show you how to make them with "On the Plate". All visitors to the school must sign in.